NORMAL — Illinois State University’s Emergency Operations Center (EOC) is unique among emergency response centers at universities. And Eric Hodges is pretty proud of that. A hot EOC is an emergency management term for a dedicated space that requires no setup when it’s time to go. “You turn on the lights and you are ready to go and that’s a game changer,” Hodges said. In August 2013, Hodges was named emergency manager and getting a dedicated EOC was first on his list. But in the next six months there were bomb threats, wind damage on the tail of the Washington tornado, a couple of polar vortexes, and a series of water pipe breaks on campus. “It’s been kind of quiet since,” he said. The EOC’s video wall can display feeds from 22 sources. In the 1,200-square-foot center, every detail has been attended to, from a plastic tub with cell phone and laptop chargers, to the blue tubes that cover the fluorescent light bulbs, creating the calming light found in dispatch centers. When the incident management team is called in, they’re able to collect information on what’s happening in real time so they can make decisions and communicate with the campus and community. A video wall can display feeds from 22 sources, from cable news channels to campus security cameras or a live video conference. There are 16 work stations plus a dedicated space for the social media team, a 911 dispatch station for police, and a row of two-way radios. The EOC allows communication between the University, county public safety officials, and most state agencies, Hodges said. 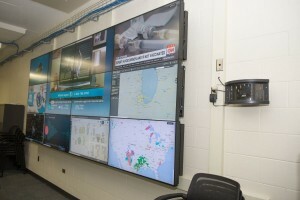 Dan Smith, regional coordinator of the Illinois Emergency Management Agency, applauded Illinois State’s work to create a dedicated EOC, the first of its kind among state universities in Illinois. There are 16 work stations inside the new EOC. He added that it’s one thing to have a space; it’s another to have a team trained to use it. “ISU has done that,” Smith said. There is redundancy within the team; each member has two backups. They also get some practice. 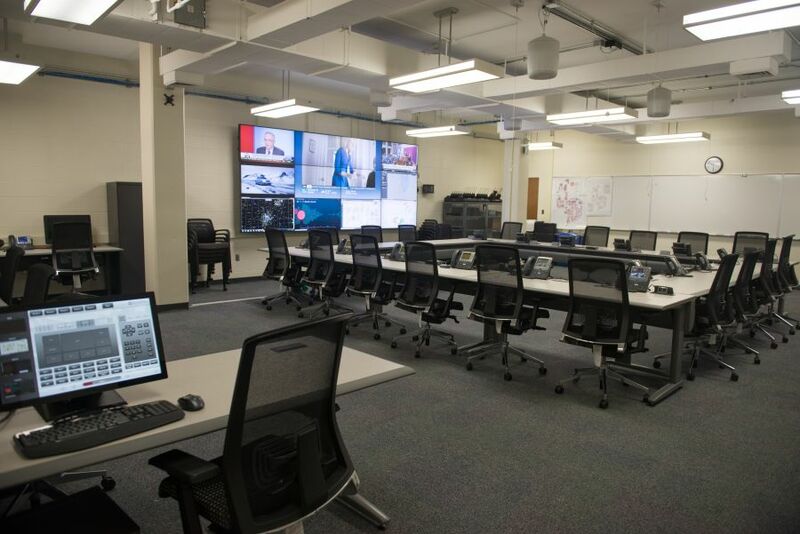 The EOC isn’t just for emergencies; it’s the University’s command post during planned events, including football games, major concerts, commencement and Homecoming. Every call for aid is tracked, from a health emergency to a fire from a tailgater’s grill. Computerized maps provide layers of information about campus buildings, and that detail comes from a partnership with the Department of Geography-Geology. John Kostelnick, associate professor and director of GEOMAP, consulted with Hodges on data-driven mapping, along with Daniel Moore ’14. Moore spent months capturing, manipulating, and storing data that provides floor plans for every building, along with other details, such as parking spaces and utilities. Hodges has been using a Geographic Information System (GIS) as a volunteer with the McLean County Emergency Management Agency the past 10 years. “I’ve seen the value in search and rescue operations,” he said. Hodges worked with Environmental Health and Safety, Facilities and the Office of Academic Technologies to design the space. His entire career has been in information technology with a parallel volunteer career in emergency management, and he’s dreamed about a dedicated EOC. “This was a vision I had from working with EOCs around the country,” he said.